Sifting through the internet’s conjecture and extracting the economic truth. 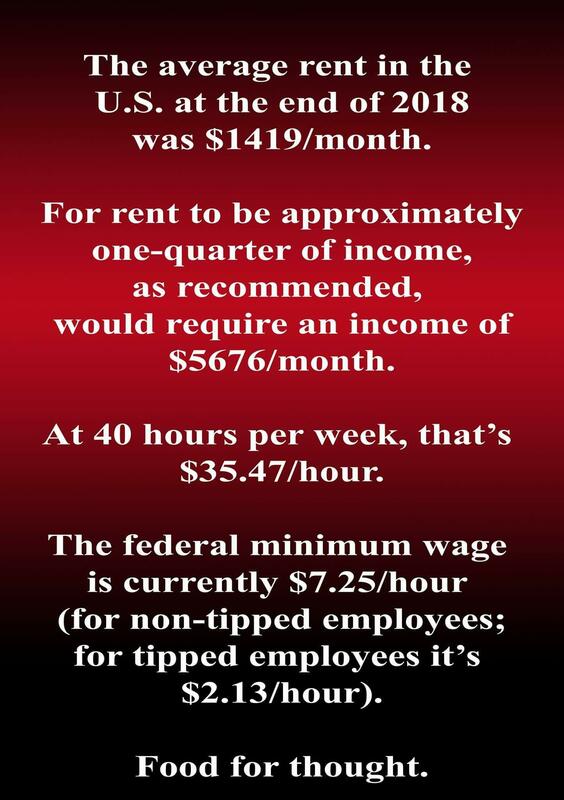 It has already been shared over 109,000 times, and it is just one of a number of similar viral claims regarding minimum wage and housing from people engaged in the #FightFor15 (or I suppose #FightFor33 if you’re the New York Times). They each make the case that housing is unaffordable for people working minimum wage jobs, largely in service of the overall case to raise the federally mandated wage floor. So what’s wrong with these memes? As it turns out… quite a bit. One major red flag that should be immediately apparent is that the numbers for all three viral images are completely different. The first claims that the average rent is $1,418, the second claims $1,234, and the third is presented more circuitously but implicitly claims $1,018. So who’s right? According to the US Census, nobody. The NLIHC graphic comes close, but the latest numbers show that as of 2017, the real median rent in the United States was $1,012 per month. This makes Thomas Corbett’s rental price claim 40 percent higher than reality and it makes the one from “pookleblinkie” about 22 percent higher, so we can dismiss both of those as factually off-base from the start. NLIHC’s website states that their source for housing prices is HUD’s “Fair Market Rents” database, so for the sake of argument, I’m happy to overlook any minor discrepancies there. To their credit, they also show a state-by-state comparison, which is important because the average cost of living varies significantly depending on what part of the country you’re in. That said, even state-by-state data is probably insufficient as the significant cost of living differences are found between urban, suburban, and rural areas. Not merely based on what state you happen to live in. Still, the idea that low-income earners have absolutely no way to afford housing is a popular belief, and even if the median rent for the United States is $1,012 a month, that would still be well out of range for someone earning the federal minimum wage of $7.25/hour. In fact, even if 100 percent of the minimum wage earner’s income went into housing—which is clearly impossible—they still would not be able to afford a home at all. But here’s where we see another serious flaw in the argument. We’re not comparing apples to apples. It makes no sense to compare median rental prices to the lowest possible wages. It would only make sense to compare the bottom of the wage distribution to the bottom of the rent distribution. Making a more accurate comparison reveals a completely different picture. For instance, when we compare median rental prices to the median household income in the United States for 2017, we find that the annual cost of renting would be $12,144 on a salary of $60,336/year. That means that the median rental price is only 20 percent of the median household income. Unfortunately, I don’t believe there’s any way to break down rental home price data by quintile, but anyone familiar with the concept of a “median” knows that it is the number that falls in the middle of the data distribution. This means that just as there are an immense number of rental homes that cost significantly higher than $1,012/mo. 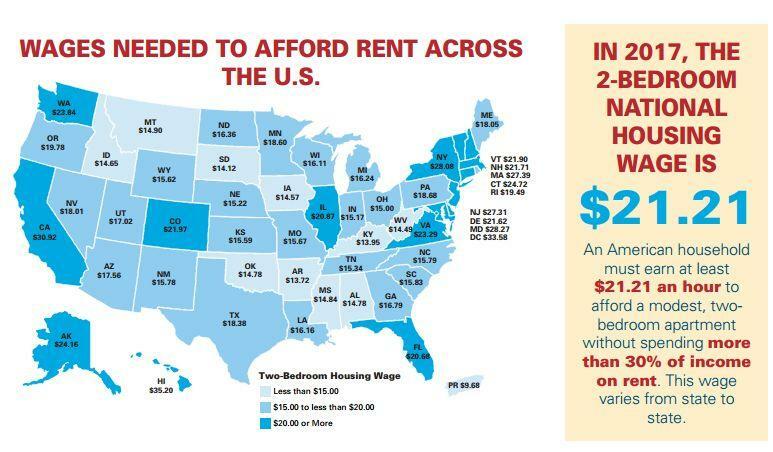 throughout America, there are an equal number of rental homes that cost less than $1,012/mo. There are also a number of housing options that make a lot more sense than trying to rent a place by yourself as someone working a single minimum wage job. What’s so Tragic about Roommates? As someone who has spent his entire adult life post-bachelor’s degree living in expensive major cities (New York, Los Angeles, Washington, DC, Atlanta), I had roommates in every apartment I lived in long after my wages exceeded minimum wage. This is perfectly normal, and sharing costs is hardly something to see as a hardship or a social justice issue. As an added bonus, some of my former roommates are still close friends. Another way to reduce living expenses is to rent a single room in an existing house—something I have also done at various points in my life. That can bring rental expenses down to the low hundreds of dollars per month even in city centers. And speaking of city centers, the closer you live to the hub of urban activity, the more expensive rental prices are going to be, so expanding your apartment search to homes that are farther away and commuting in can also save hundreds of dollars a month on rent. Like many adults, I’ve used each of these approaches to pay less than the median rental price in multiple cities, and I don’t think anyone should regard any of these experiences as humiliating or cruel. To the contrary, they are all frugal ways to make the most of your income. This is also to say nothing of policy changes that would make new home construction more affordable and less time-consuming by streamlining the permitting processes, reducing zoning restrictions, reducing the number of aspects of the process that require city approval, and just generally lowering the barriers to building. Those kinds of policies would pave the way (pun intended) for an increase in the supply of new homes, which would reduce the cost of existing properties. Tragically, the inaccurate cost claims are not the only major errors embedded in these images. They’re also more subtly deceptive regarding the demographics of minimum wage earners themselves. Each of these memes suggests or implies that minimum wage workers are primarily adults with families who have only one income-earner. They also imply that a significant number of people are stuck in minimum wage jobs for their entire lives. And from the way our society frequently talks about minimum wage earners, you’d think that they were a massive group of people. None of these implications are accurate. Although workers under age 25 represented only about one-fifth of hourly paid workers, they made up about half of those paid the Federal minimum wage or less. Furthermore, people who work minimum wage jobs are far more likely to be unmarried/never-married, to lack a high school diploma (hardly a surprise when a large portion are still in high school), and most—64 percent—are working part-time. If when you picture minimum wage workers, you think of the high school or college-aged kid working at a grocery store or a quick-service food restaurant, your picture is pretty accurate. That’s not to say that there aren’t older people with children trying to support themselves on minimum wage jobs. There are, but they are comparatively rare. Only about 15 percent of all minimum wage workers are the primary provider for a family with one or more children. That’s just 0.39 percent of the total workforce, which is around 600,000 people in the entire United States. And of course, that group certainly qualifies for numerous forms of public assistance, including EBT and housing subsidies—which has not been factored into any of these memes either. I know this has been a lot of statistics and math, but my goal is to arm the valiant readers who have made it to the end of this article with some better information and some logic so that when you’re browsing Facebook and come across misleading memes, you’re better able to spot the errors.